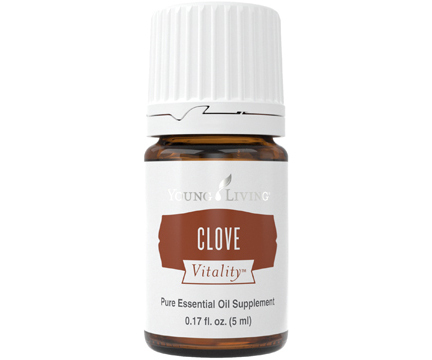 Clove (Syzygium aromaticum) Vitality™ essential oil is the concentrated distillation of the same distinct, spicy cloves that have been used in kitchens for thousands of years. Perfect for adding flavor to both sweet and savory dishes, Clove Vitality oil includes the naturally occurring constituent eugenol and is beloved for its use as a dietary supplement. When taken as a supplement, Clove Vitality essential oil promotes a healthy immune response* and may support overall wellness*, making it an important part of our Thieves®, ImmuPower™, Inner Defense™, and Longevity™ formulas. * Clove Vitality Essential Oils Uses: Support your healthy immune system* every day or as needed by adding a drop of Clove Vitality to a vegetarian capsule and taking as a daily dietary supplement. Substitute Clove Vitality for the ground spice in recipes. Bring gingerbread, molasses cookies, and spice cake to life by adding a drop to the batter. Combine Clove Vitality with the Vitality oils Lemon, Cinnamon Bark, and Nutmeg in homemade cider or wassail recipes. Try adding a drop of Clove Vitality to a warm bowl of oatmeal for a tasty, comforting start to your day. *These statements have not been evaluated by the Food and Drug Administration. This product is not intended to diagnose, treat, cure or prevent any disease.